The application of imaging continues to play an increasing role in the evaluation of patients with suspected genitourinary disease. Cross-sectional imaging is now routine in evaluating renal vascular abnormalities in both the native and transplant kidneys. Grayscale and Doppler ultrasound have become the first-line modality for this work-up in many institutions. These modalities provide anatomic and functional information about the kidney function and vascular supply. 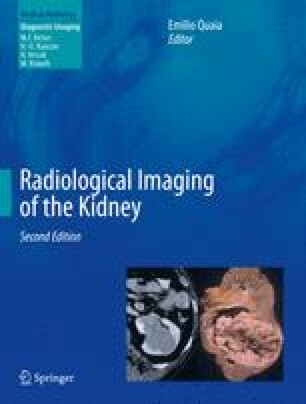 In this chapter, normal anatomy and disease processes will be reviewed, emphasizing the various strengths and weaknesses of ultrasound, computed tomographic angiography (CTA), and magnetic resonance angiography (MRA).